Appearances can be deceiving especially when it comes to horses. And the differences between wild horses and domestics horses might be far greater than many people may even realize. Too many people today who have experience with or have been exposed to domestic horses tend to automatically assign the same characteristics and specific traits to wild horses. This is a big mistake for many reasons not the least of which has created severely flawed wild horse management policies. The behavioral ecology of wild horses is in some ways more akin to that of wild cervids, which have been studied extensively, unlike wild horses where there is scant funding available for such studies leading to very limited information by comparison. Like many people who grew-up with, cared-for and used domestic horses on a ranch for riding and herding animals, my wife and I believed we both had a reasonable understanding of all horses, including wild horses. It wasn’t until we retired on to our wilderness ranch and lived among wild horses and studied them at close-range in a natural ecosystem that our eyes were opened and the learning truly began. This rare opportunity was not easily in the making, logistically or financially. And living in the wilderness even with the aid of some modern technologies is not so easy. Nevertheless, once we settled in to our new lifestyle and adventure in the mountains, we became the subject of study by a small herd of local wild horse families. Appaloosa mare ‘Lucy’ and her filly ‘Pixie’. First they observed us at distances ranging from a quarter-mile to 100 yards, often times from the cover of forested areas. Even at night they watched us from the dark recesses of the forested mountains. Then one day weeks later an Appaloosa mare with a nursing filly approached Laura and I as the rest of her family held back about 50 yards away. It was clear she was suffering from a severe parasitic overload. Her ribs were showing even though there was abundant grazing available via native grasses and brush. Of course as a former livestock rancher I knew the signs of parasitic overload. Some mammals cope with gastric parasites better than others, and a nursing mare is even more vulnerable since she is diverting a lot of nutrition to her foal. It seemed that this sage old Appaloosa mare somehow sensed we would help her, which we did. We had some wormer for our dogs that I knew contained the active ingredient ivermectin and in a properly adjusted dose would safely work in pregnant and nursing mares to abate the parasites. As the family stallion and the rest of his harem intently watched the interaction, we mixed the wormer into some of our steel cut oats breakfast cereal and the mare cautiously ate all of it and then returned to her family. It was our first encounter with these sentient beings and both Laura and I felt it was a positive one. However, we had a suspicion that unlike the rest of her family, the old appy mare was likely a domestic horse who was released some time ago into the wilderness and she had some experience with humans. This experience was our first clue as to the biologic (genetic expression) differences between a domesticated ‘breed’ and the local wild horses, which as we know now, four years later, seem far more resilient and resistant to the adverse effects from parasites. In fact, even though the vast majority of wild horses likely carry gastric parasites, most show little or no outward symptoms. As I pondered this contrast in resistance to the effect of parasites, I wondered what other traits were differentiated between the breeds and wild horses. As some people understand, all horses in the world today first evolved on the North American continent. Then sometime about 17,000 years ago many of these horses made it across the Aleutian land bridge into Asia and over time migrated to areas west, including Europe and Africa. Human civilizations immediately took advantage of the capabilities of these strong and highly intelligent beings. Men began to systematically and selectively breed wild horses into what we now see thousands of years later in the forms of a variety of horse breeds with a myriad of different characteristics and traits. And through extensive selective breeding of equids, desired characteristics and traits were greatly amplified while other known and unknown characteristics and traits were diminished and in some cases are likely lost in the new breeds. The science of genetics supports the foregoing assertion and as all domestic horse owners know, domestic breeds today suffer from a host of maladies stemming from selective breeding programs. And by contrast many of these same maladies are not seen in wild horses, as is our experience here in the wilderness. As wildlife ecologist and horse expert Craig Downer has said; “the vigor of the species is preserved in the wild”. In yet another example of the adverse effect of selective breeding damaging gene lines; in canines we find that many German Shepard dogs suffer from hip dysplasia, a now common genetic defect arising from selective breeding. The critical point here is that there are important and rare genetics that encompass specialized characteristics and traits (abilities) that exist only within the populations of the relatively few remaining wild horses in America, which now number fewer than 67,000 running free. Today there are several exciting scientific studies underway where domestic horses are being effectively used to heal people with various debilitating conditions, such as PTSD. The healing arguably occurs as a result of the effects of what is now known as bio-field energy-waves, which are included in the field of study of an emerging science known as bio-field physiology. Is sounds complicated and admittedly at some levels it involves physics (quantum mechanics), however I have summarized some of this material and added some links to easily understood videos for those who want to gain important insights into this material. The foregoing considerations and discussion is critical as it applies to the use of domestic horses in the efficacy of bio-field healing and is relevant due to the large and powerful bio-fields that are projected by horses in general as measured and observed in clinical and experimental settings. Are there genetic differences in horses (breeds versus wild) that have implications in the characteristics, traits and abilities related to biofield energies and biofield healing? And, how have selective breeding programs affected the bio-fields and empathic abilities of domestic horses? In terms of biofield energy in the realm of discrete energy dialogue, we must ostensibly consider it as a form of subliminal communication. 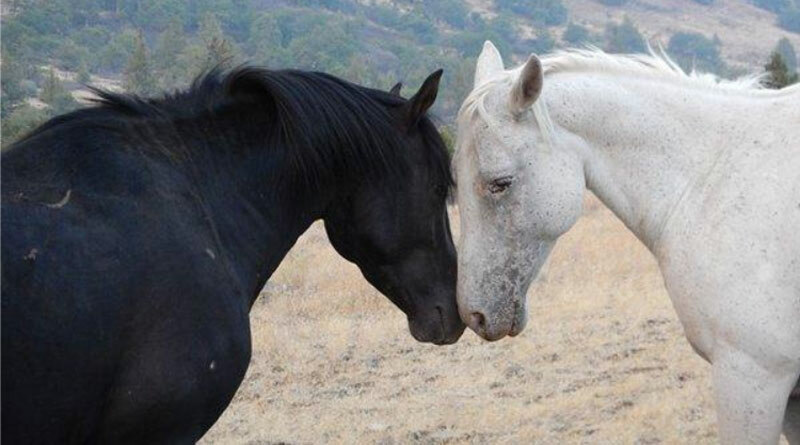 Biofield healing is likely an instinctive trait and ability used through the millennia within families of wild horses as their version of our healing arts and medicine. And we know from our local observations of wild horses here on our ranch, they have healing abilities that transcend those of any domestic horses we are aware of. In fact, we have documented numerous injuries that local domestic horse experts as well as a highly experienced equine veterinarians claimed were not survivable, where the wild horses did in fact survive. Left, Buck’s leg injury, and fully healed four months later. However for whatever reason after being allowed by Buck into his personal space as we surveyed his injury, we sensed he wanted to live, even though he had sustained an injury that would have caused any domestic horse to ‘pack it in’. Along with many scientists we strongly suspect there is a lot more to bio-field physiology in the form of discrete energy dialogue. Some people describe these communitive forms of energy (that are not species dependent) without any formalization as ‘sensing’ something. So we provided Buck with a path to live by simply making minerals, water and some hay available to him and then watched him carefully. He was not subjected to any forced treatment or suturing. And amazingly to all, Buck healed himself of an injury that was considered mortal. Buck is not the only example of a wild horse that demonstrated an amazing ability to heal. We have many experiences here on the ranch where injuries that were sustained by wild horses and were considered un-survivable by genuine domestic horse experts. Yet time and again, these wild horses displayed amazing healing powers and the will and heart to overcome horrendous injuries. Another example was an injury to a young colt (‘Elvis’) in a family who was savaged by a mountain lion. Left, Elvis on the morning of the lion attack. Middle: A month after the attack. Right: Four months after the attack. And we have many other documented accounts of miraculous healing among wild horses. But it didn’t stop there; we had a combat soldier with PTSD who benefited from the healing powers of the local wild horses during his visit, which changed his life. It’s my assertion that selective breeding over the centuries has in many ways detracted from the potency of the original genetic characteristics and traits of wild horses, and has to some extent adversely impacted their abilities. Further complicating this problem is the exigent situation with a plummeting population of American wild horses at the hands of managers who cannot possibly manage them since they have no true expertise in their behavioral ecology. Added to this catastrophic deficit of knowledge and experience is the concurrent failure in the comprehension of the special characteristics and traits of wild horses that stem from their rare and important genetic lines. Genetic lines are also being further devastated through the unnecessary use of dangerous chemicals (PZP) and other draconian birth control methods by advocates in addressing the myth of ‘over-population’ assigned to wild horses on public lands by the BLM, which is managing them into extinction. Unfortunately, there is nothing ‘fortunate’ about the use of PZP on wild horses. And the National Academy of Sciences does not have the requisite depth of experience that only comes from living among and studying the behavioral ecology of wild horses in a naturally operating ecosystem in order to offer the opinion that Price cites in her article. They are simply meddling into area where academic science is at odds with natural science on the ground. For Price, the use of PZP on wild horses at her sanctuary is one of only a handful of options that might be used in a non-natural environment, such as we also see in zoos, so there may be an argument for its use under careful ongoing medical observation. When wild horses such as those who have lived in our local ecosystem for at least the past century are subject to a naturally operating ecosystem, we empirically find that apex predators do more than just control wild horse populations. In fact, the population of our local wild horse herd has dropped from about 67 adults to about 52 adults in the past four years due to predators, primarily mountain lions (we have documented numerous predations). Too many people today have been misled by those who are quite willing to deny the relative few remaining wild horses their freedom in a truly natural habitat, and instead favor livestock production for consumer products on public ranges. Added to the lunacy are those who recklessly condemn American wild horses into extinction, much to the great loss of mankind. This is especially concerning since there is a practical option that would alleviate the conflict between the livestock industry and wild horses. There are millions of acres of remote wilderness forest that can provide ideal habitats for wild horses, that because of terrain and predators is not suitable for livestock management. We know for a fact that wild horses do well in these areas as we have seen in our local forest ecosystem and have done so in ancient times as we read in this Cosmos article. American wild horses are literally on the brink of extinction and this must be addressed and halted immediately. They must be re-allocated into areas where they are not forced into conflict with livestock enterprises on lands that through livestock management practices do not represent natural wild horse habitats and ecosystems. Wild horses are symbionts: Over the millennia during their evolution on the North American continent, wild horses have evolved mutualisms with a myriad of species within many biomes. Wild horses do exceptionally well in and around remote wilderness forest areas, and they are natural foresters. Wild horses are commensal with deer, and the dietary overlap between deer and wild horses is only 1%, while the dietary overlap between deer and cattle is 4%². The concept of the Wild Horse Fire Brigade offers a solution to the issues as seen by the livestock industry (moves wild horses away from managed livestock grazing areas); saves the BLM $50 million annually by moving corralled wild horses into and around carefully selected remote wilderness areas; and finally, wild horses can safely replace the depleted west-coast deer populations that are no longer abating the hazardous ground fuels that fuel recently evolved catastrophic wildfires. In discussing the free-roaming horses and burros of the American West, the International Union for the Conservation of Nature (IUCN) argues that “the animals’ ability to adapt to harsh conditions is a justification for their preservation.” IUCN points out that “the selective pressures they have endured in the wild are likely to be shaping them genetically, producing hardier stock which may prove a useful genetic resource.” IUCN notes another important argument in favor of conservation: their cultural value.